The only reason we were on the stupid streetcar to begin with was because the Pink Panther was in the shop. Again. And the only reason we were on the streetcar together was because we were registering me at a new school, Northern Heights Collegiate, for grade nine. “It vas his tinking.” She gripped my knee in a vise. She has beautiful hands, my mama. I’ll give her that. Mama insists that you can’t be a first-class, top-notch real estate agent without good hands, and it almost makes sense. That’s how Mama usually gets me—by almost making sense. She had me until the class bit. Papa didn’t care about first-class people. Papa was first-class people. Okay, not at the moment, or for the last six years or so, but he was. Mama said so. Even the Aunties said so and they can’t stand him. Mama patted my knee in a lame effort to restore my circulation. Well, she had that right. Two weeks late into grade nine. Lifelong friendships among the new kids had been formed by day four at the latest. Last year’s middle school and junior high groups, with a summer addition or two, were locked into airtight cliques that would take them into their child-bearing years. I was DMOA, dead meat on arrival, and that was before anyone figured out about Papa. “I’m not remembering,” she sniffed. Mama learned English off the subtitles of old Hollywood movies. You could learn Russian as a second language in Mama’s little Bulgarian village, but English was forbidden, so that’s how a lot of people did it. Picking up a whole language from old movies is pretty brilliant, if you think about it. It’s just that she sounds as if she’s in an MGM musical half the time. Papa doesn’t. He learned his English in Poland, where they didn’t want you to speak English either, but somehow Papa had picked it up perfectly. Maybe it was because Papa is a Polish prince. Really, that or a duke or a count or something seriously up there like that. Despite the royalty connection, I’m a mongrel. I don’t even know what religion I am. Papa was baptized Catholic but Mama was baptized atheist. Claire O’Conner took great care to explain my mongrelness to me in grade six. She was Irish up and down both sides of her family. “Hundred percent pure,” she said. See, Mama is from Bulgaria, Papa is from Poland, they met in Romania, and they had me in Hungary. Apparently, being an English-speaking Polish prince-type person was not a good thing to be in any of those places, so we all moved here when I was four. I don’t remember any of it. That’s okay. I’ve got enough to remember with what I do remember. I used to try playing the Polish prince card when things got ugly at the other schools, but murderer trumps prince at recess every single time. No more, no sir. I wasn’t going through that again. Mama wasn’t there in the playgrounds, in the cafeterias, in the washrooms—all those washrooms. Okay, really, really slowly, but I did, and it didn’t have anything to do with being surrounded by “first-class peoples.” Surviving school had to do with power. Papa was right: You have to make yourself bulletproof. This time I was going to squeeze myself right into the middle of the power source at Northern Heights. And after five schools, I knew for sure that the power source was going to be the Blondes. See, I figure if you are in tight with the Blondes, you’re in till you die. It’s like back-stabbing and banishment are for the rich-redheads and the brunettes-with-boyfriends cliques. They had power circles with rings of wannabes at the edges who were ousted, then grudgingly welcomed back in, or not. That sort of stuff was beneath the Blondes—Blondes were forever. 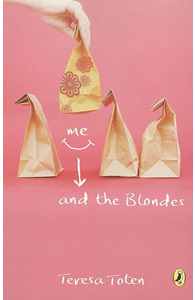 So, first thing, before anything, I had to find my Blondes and make them adore me. How hard could that be really? I mean who were the Blondes but the granddaughters of the Crabtree & Evelyn ladies, and they adored me. Who was I kidding? DMOA. Remember? I’ll join him by tomorrow afternoon. As we disembarked, the streetcar driver winked at us or her or me. I can never be sure with Mama. The school was across the street. I had to admit, not to her of course, that it was pretty, one of those really, really old-style schools. The sign over the front entrance said northern heights collegiate, 1917. The building had a lot of that detailed stonework that you could get in those days because, as Claire said, the Irish would do all that stuff for the price of a potato. And there was tons of green space with big old oaks and maples where all the portables should have been. Actually, it was beautiful. Mama and I swung open the heavily carved doors and landed in the main foyer. It may have been a high-class high school with high-class students, but the place still smelled like every other school foyer I’ve ever been in. Only two weeks into the year and it reeked like the inside of a gym shoe. It sort of calmed me down to know that rich kids’ sweat stinks just as bad as poor kids’ sweat. I trailed behind Mama as she swanned into the registrar’s office. An old lady, maybe forty, was barely visible behind stacks and stacks of paper. As soon as Mama and I sat down, we lost complete sight of Mrs. Haver behind the paper towers. Mama cast down her eyes, put her hand on her chest, and sighed. “I am a professional real estate voman. Ya? Ve move all za time to better our situation, you understand? Since her …” now a pitying glance in my direction, “her fawder dropped dead, may he rest vit lots of peace. Oh, he vas a Catholic, but not really a big von, you understand.” Even deeper sigh. “It is not easy for vidow ladies. So, ve move and move and now ve buy, and ve are in your first-class district.” Full beam. I crossed my eyes at her. Mama can read perfectly in Bulgarian, Russian, French, and even English, but she can’t read a word without her glasses, which she point-blank refuses to wear in front of another human. I’d have to check all the forms when we got home. “Condominiums,” I said, just for the sake of saying something. “You can say that again. And your daughter … Sophie?” she called. I heard a gasp. It was me. “It vas?” Mama looked puzzled. I nodded furiously at her. “Thank you, ma’am.” She called me Sophie, not Sophia. Sophie. I liked it. I liked it a lot. It sounded breezy, carefree, potentially popular. Mama practically skipped out of there, stiletto heels and all. She hadn’t moved like that in a long time. Years even. I was kind of skipping too, on the inside. Sometimes, I disgust myself. I mean, I haven’t seen or talked to Papa in forever, and then we go and kill him off. We kill him and I feel great? What was this? I like to be nice. I want to be famously nice. It’s like a serious goal and everything. When people hear my name, I want them to feel compelled to say, “Sophia—no Sophie—is sooo nice.” My hunch is that you can’t kill off your father, feel really good about it, and still be considered nice. Oh well. I could live with that. 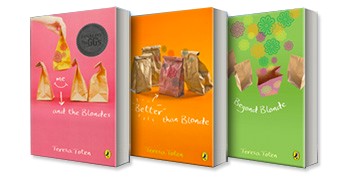 Excerpted from Me and the Blondes by Teresa Toten. Copyright © 2006 by Teresa Toten. Excerpted by permission of Penguin Books. No part of this excerpt may be reproduced or reprinted without permission in writing from the publisher.